THE CITY OF GRANITE AND GRANDEUR. Famed for its numerous quarries, Jalore has risen to prominence for producing some of the finest granite in the world. Originally a small town, industrial growth has helped Jalore grow by leaps and bounds in recent times. The ‘tope khana’ or cannon foundry at Jalore Fort is the foremost tourist attraction of Jalore and it provides stunning views of the city. The city is also famed for the Sundha Mata Temple which was built around 900 years ago and is sacred to the devotees of goddess Chamunda Devi. Believed to be founded in the 8th century AD, Jalore was originally called Jabalipur in honour of the saint Maharishi Jabali. The town was also known as Swarngiri, after the hill at the foot of which it is situated. Over the centuries a number of clans ruled over Jalore including the Gurjara Pratiharas, the Parmars and the Chauhans until the city was captured and destroyed by the Sultan of Delhi, Ala-Ud-Din-Khilji. After 4 centuries the city was finally restored back to the rulers of Marwar in 1704. Come explore the wonders and sites that Jalore has to offer you. There’s always something to see in Rajasthan. The main attraction of the city is the Jalore fort. It is an impressive piece of architecture and is believed to have been constructed between the 8th and 10th centuries, the fort is perched atop a steep hill at a height of about 336 metres and offers exquisite views of the city below. The highlights of the fort are its high fortified walls and bastions with cannons mounted upon them. The fort has four massive gates but is only accessible from one side, after a two-mile long serpentine ascent. Located in the midst of Jalore city, Topekhana was once a grand Sanskrit school built by King Bhoj sometime between the 7th and 8th centuries. A scholar of Sanskrit, King Bhoj is known to have built several similar schools in Ajmer and Dhar to impart education. The school was renamed Topekhana during the pre-independence period after officers used the building to store artillery and ammunition. Today, the structure of the building is in disrepair but it is still extremely impressive and is adorned with stone carvings. Two temples flank the Topekhana on either side but they no longer house idols. The most impressive sight of the Topekhana is a room built about 10 feet above the floor of the building with an imposing staircase leading up to it, the room is believed to have been the abode of the headmaster of the school. Commissioned by Ala-Ud-Din-Khilji during his reign over Jalore, the mosque was built to honour Malik Shah, the Seljuk Sultan of Baghdad. The mosque is located in the centre of the Jalore Fort and is particularly distinct for its style of architecture, which is believed to have been inspired by buildings found in Gujarat. Located at a height of 646 metres on the Kalashachal hill, the temple is believed to have been built by Rawal Ratan Singh in honour of Maharishi Jabali. Legend has it that the Pandavas once took refuge in the temple. The path to the temple passes through Jalore city and one has to make a 3 km trip by foot to get to the temple. Atop the Sundha Mountain in the Aravalli Range lies the Sundha Mata Temple. This temple is built at a height of 1220 m above sea level and is regarded very sacred by devotees from all over India. The temple houses an idol of Goddess Chamunda Devi and is made of white marble. The design of the pillars is reminiscent of those of the Dilwara Temple in Mount Abu. This temple also features some inscriptions of historical value. Be a part of the festivities and traditions that Jalore has to offer. It’s always a celebration in Rajasthan. Engage in the many activities, tours and adventures that await you in Jalore. There’s always something to do in Rajasthan. At 140 kilometres, Jodhpur is the nearest airport with daily flights from Mumbai, Delhi and other major metros around the country. 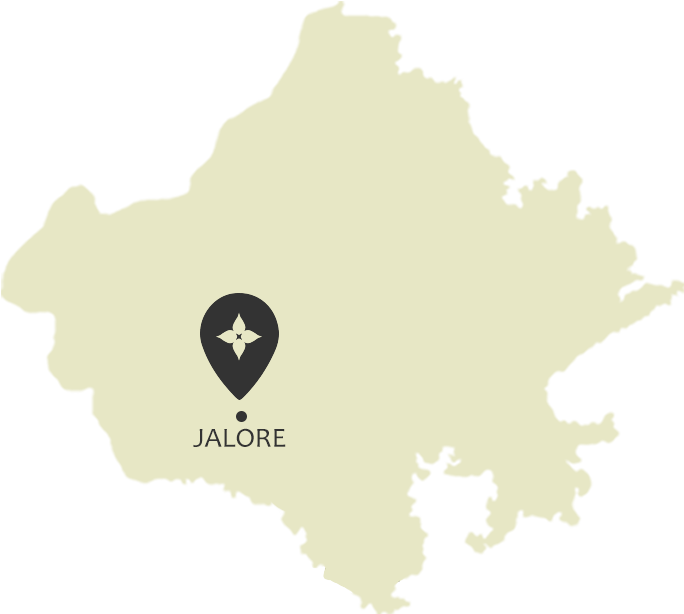 Jalore is well connected to all major cities in Rajasthan. One can also opt for a private bus from Jodhpur, Jaipur, Ajmer, Ahmedabad, Surat and Mumbai. Jalore is connected to the Jodhpur division network and a number of trains from Gujarat and Mumbai halt at Jalore railway station throughout the week.